Allan Hoffman is riding the wave of popularity with his book about the camera you always have with you – your iPhone. As a matter of fact, that’s one of three reasons he thinks the iPhone camera is so popular – the other two being that you can customize this camera and you get to use Photoshop effects without leaving your phone. I just recently went to my local AT&T store here in Cleveland and upgraded my iPhone from the 3 to the 4. There are just so many more compelling apps available for the iPhone 4 that it made it an obvious choice once my contract had expired. I had already started reading Create Great iPhone Photos before I upgraded, and it was one of main reasons I decided to upgrade now instead of waiting it out for the iPhone 5. Since the original iPhone, Apple has continually upped the ante with each model, increasing resolution and features. With iPhone 4 they even finally added a flash. Now, more people are leaving their cameras at home and doing quite well with just their iPhone. This book is a wealth of information for all those packing the iPhone, from accessories to apps. Some of the best apps add functionality that just doesn’t exist with the native Camera app from Apple. Things like a self-timer and burst mode shooting are available in various apps. Better than half the book is dedicated to post processing your photos with all those different apps available on-line. Each description offers color photos that make it easy to understand what you are getting before you pay for a certain app. Whether it’s Comic Strips (pg 139) or Geotagging (pg 158) or ToonPaint (pg 143) or SodaSnap Postcards (pg 166), there are lots of apps I’d never seen before while cruising the AppStore. In addition, Hoffman gives suggestions with using iPhone photos on your blog or Facebook. 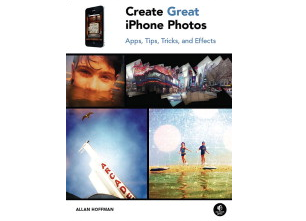 There’s lots to like in this book if you are getting started with iPhone photography. I can just about guarantee you’ll find many things you never knew. This book should be on the shelves in Cleveland at Borders or you can order it online at Amazon or O’Reilly Books.